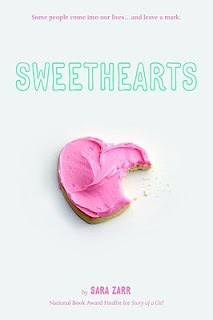 This book had me peeved even though I wanted badly to give this rating a three, I wanted to love 'Sweethearts' but I was disappointed because of 3 things that I will get to later. The book at the start was simple, or as simple as a man being a total jerk to his kid and creeping on his child's friend can be. But really I kind of liked how clear-cut, (writing wise), it was for the first 60 pages, although eventually I got frustrated and what I thought about Sara's writing didn't matter anymore. I didn't choose this book because of the hype, but the summary and story line - and for lack of a better word, I thought it would be neat! I mean childhood friends separating for years and then coming together again after all that time, still sharing that bond and gravity to each other is my idea of sweet mush: a book I'd want to sneak and devour for long, long hours! (And btw, if anyone has reads like those don't hesitate to recommend them...It would make my day.) The idea in my head was this would be romantic and classic, my type-A read. But the thing here is, that didn't happen. Reason one for my anger at 'Sweethearts' stems from the fact that I didn't feel as though the book delivered. I followed the emotional roller coster of relationships and self-reflection for what - 217 pages - for that kind of ending?! I won't give anything away but the worst part is that it isn't a series, people, so the lines on the last page is as good as it gets. That there is reason one. Why make it out to be this romance if it ultimately isn't? That makes no sense to me, give the reader what you promise or don't promise at all. I felt like I was lied to, drawn and baited by that yummy cookie on the cover. (Darn, she found my weakness!) *Stuffs Godiva down shirt and runs for the hills towards the Von Trapp's, but slowly returns to finish review. * Seriously thought,that is not cool. Give me sugar and sweetness, warm romance is what I'm after. M.J said it right, "Togetherness", not empty promises! But moving on...Reason two is simply that the characters didn't connect for me, there was a place in my heart wanting to hold and understand Cameron and Jenna but I couldn't. I couldn't get why after so long of missing and wanting each other, you finally find that person and then just let them go. What does that say about your 'love'? I know the saying: "love them and set them free" but that to me is the absolute last resort. I will not go down without kicking and screaming (figuratively speaking)! I will remind you why the feelings between us are special and why, with every fiber of my being I want you, I love you. Again, If this wasn't the depth of Jenna's and Cameron's relationship, Sara shouldn't have made it seem this way. In reality they were confused kids trying to make sense of life and I could have accepted that...If I was told. Which leads me directly to Reason three: What a life! What with Jenna struggling with "Jennifer" issues and thorough miscommunication problems between not only her mother but everyone around her; and Cameron's needed to be so darn aloof! "Come out with it boy" I kept praying, stay with her and help each other, but he ignored me and did the only thing he felt was "right", which by the way, left them both very unhappy and empty. I was and still am exhausted and that is the only word for it. I wouldn't read this book again.